Description: Boom! Splat! Kablooey! comes with all the special equipment you need to make ordinary ingredients from your kitchen go boom in impressive — yet non-destructive — style. A Geyser Tube™ and a depth charge make table salt and a bottle of soda into a backyard geyser. A bevy of balloons turns a regular pop into a big ol’ BOOM. And the Can o’ pops is specially designed to explode again and again and again and… you get the idea. We’re all charged up to get kids learning about science. And have a blast doing it. Written by Pat Murphy and the Scientists of Klutz Lab. WARNING: CHOKING HAZARD! Children under 8 yrs can choke or suffocate on uninflated or broken balloons. Adult supervision required. Keep uninflated balloons from children. Discard broken balloons at once. Jake's Review: This was so totally sic (mom's note: that means it is cool or awesome to us old people) I had so much fun playing with this book. It was loud and messy and made mom jump and made the little midget cry (mom's note: that would be his little brother). I want a whole bunch of books like this for me and my friends to play with. I wish our teachers used experiments like this to teach us science instead of the boring things they make us do. I wish the book was longer and had more things with it that we could experiment with. The only other thing I didn't like was that mom made me clean up everything after we were done while she sat in the front room reading and drinking a glass of wine - not fair, she was playing too! 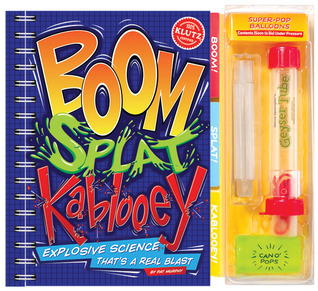 Mom's Review: I have to agree with Jake this book was so much fun and that kids would be far more interested in science if they had the opportunity to try experiments like the ones in this book. There are tons of bright colours, funky fonts and silly pictures to grab the children's attention and encourage them to keep looking through the book. 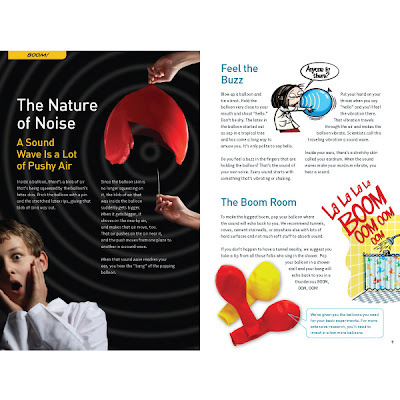 The experiments are easy to follow and use items that most people either have available in their own homes or can easily pick up at the dollar store. This is a fabulous book to use during a rainy day and something the whole family can do together. I love that kids will learn science in such a fun and interesting way and they won't even know that they are learning something -- nothing better than tricking the kids : ) Take note teachers, if you want kids to learn make it fun and hands on, it will make your job a lot less stressful. Also the experiments are easy for the kids to clean up afterward so you can enjoy some time to yourself while the little heathens tidy up. 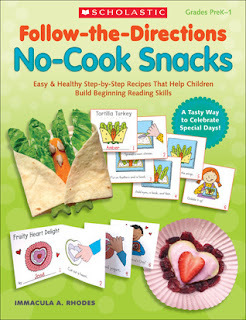 Description: Make snack time learning time with tasty no-cook recipes that kids can make all by themselves! Each easy-to-follow reproducible recipe features step-by-step cards that kids can color, sequence, and then compile in a take-home mini-book. Designed to connect with holidays and special days throughout the year, the recipes feature healthy, low-cost ingredients that are easy to gather. A tasty way to foster good nutrition and build beginning reading skills! For use with Grades PreK-1. Jake's Review: I like how easy everything was to make, but there wasn't a lot of recipes that I actually wanted to eat. Way too many items with vegetables and hummus. Also this is way too babyish for me, I already know how to cook and bake. This would probably be better for little kids like Jesse, ah well kids like Jesse who actually eat stuff other than pizza and grilled cheese (mom's note: shhh don't tell everybody that Jesse only eats that stuff, they will think I am a bad mom). It was fun making all the different snacks even-though I didn't eat them. I liked how you cut out each of the recipes and make them in to little books and you even colour in the little books to make them look nicer - they are kinda boring in all black and white. I would like more books like this that are a little more for my age and use chocolate, chips and no hummus! That would be much more fun! Mom's Review: This was another fun book that the whole family worked together to do -- even Jesse! The directions are easy to follow even for a child as young as 3 (Well, with the help of parents of course) to try. It was a lot of fun cutting out all of the recipes into little booklets. At first I was disappointed that the pictures were all black and white, but Jake suggested we use them as little coloring books which was a fabulous idea. It also prolonged the excitement of the book as the kids got to cut, colour and make stuff. This was perfect as it was kinda wet and cold the day and it turned into an almost all day event which kept everyone busy and not whining about how bored they were. I agree with Jake on one point what is up with all the hummus -- my kids HATE hummus (we substituted cream cheese & cream cheese dip for it btw). The only other complaint and a really minor one is the font size was a little small for a child in the PreK age range which is who the book is geared towards - they are going to struggle with it. LOVE these 2 reviews, both will be future purchases for the little guy here! Great job Jake! Jake says thanks, as he is not allowed on the computer right now - got in trouble at school gotta punish him where it hurts LOL!